US, 1970, 90 minutes, Colour. Michael Douglas, Lee Purcell, Joe Don Baker, Louise Latham, Meg Foster. 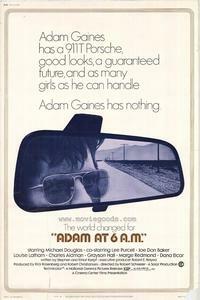 Adam at 6 A.M. is a typical film of the late '60s, early '70s. Michael Douglas starred in a number of these films including Summertree, Hail Hero. In this film he is a Professor of Semantics who goes to the Midwest for a family funeral. Weary of his life in the city, the academic world, relationships with students, he is attracted to the open air life that he finds. He works in logging, makes friends, enjoys the outdoor life. He meets a girl and plans to marry. However, he is still on his search at the end. The film captures the atmosphere of a mid-western town, the criticisms of the two coasts (especially about the films coming from Hollywood). There are interesting performances from Dana Elcar, Louise Latham and Lee Purcell. Of its time, but a reminder of the American search of that period. 1. An interesting film? American hero, antihero? The protest of the 160s? Dropouts? A film of its time? Now? 2. The atmosphere of California? Of the Midwest? City and town? Countryside? Development and housing? Logging? The use of locations, atmosphere? Musical score? Songs? 3. The title and the focus on Adam? His life? His life before him? Choices? 4. Michael Douglas as Adam: his work, the academic world? His relationship with the student? Casual basis? The brittle relationship? Family? The news of the death? His decision to go to the funerals? The journey? Moving away from California? The arrival at the ceremony, his being welcomed? The contrast in the small town style? Friendliness? Relations? Placing him in the family? Discussions, arguments? The aggressive relations and the discussion about films and permissiveness? Trying to put him on the defensive? His deciding to stay? The welcome of Gerri Jo and her family? Liking her, going out? The possibility of marriage? Her mother and father and their interest? His work, the logging, the hard experience, his enjoying It? The friendship with Harvey and the discussions? Out camping? The visits to the bar? The girls around town? His changing his perspective? Reflecting on his future? Gerri Jo and her plans? The pressure of her parents? The announcement of the engagement? The party? His hesitation? Decisions? 5. Gerri Jo and her small town mentality, attracted to Adam, her parents? Socials? Outings? Love? Tenderness? The development and her dreams of a house? Wanting to be near friends? The conventional future? Adam's counterproposal? The possibilities of travelling the world? her apprehensions? Her future? 6. Harvey and his philosophy of life, training, technician, study? A strong man? A big man amongst hard workers? The fights, the discussions? The friendship with Adam? Comparison of the two worlds? His hopes? The farewell to Adam? His future? 7. The world of Adam's relations? Small town life? Talk? Interests? The contrast with California and New York? Funerals? Family gatherings? The engagement party? 8. The world of the loggers, hard work, drinking, fighting? 9. A picture of American society at the time? Comparisons with the present? Questions of identity, commitment, future?